This student submission comes from my former student Sarah McCall. Her topic, from Precalculus: vectors in two dimensions. What interesting (i.e., uncontrived) word problems using this topic can your students do now? For such an applicable topic, I believe that it is beneficial to have students see how this might apply to their lives and to real world problems. I selected the following word problems because they are challenging, but I think it is necessary for students to be a little frustrated initially so that they are able to learn well and remember what they’ve learned. 1. A DC-10 jumbo jet maintains an airspeed of 550 mph in a southwesterly direction. The velocity of the jet stream is a constant 80 mph from the west. Find the actual speed and direction of the aircraft. 2. The pilot of an aircraft wishes to head directly east, but is faced with a wind speed of 40 mph from the northwest. If the pilot maintains an airspeed of 250 mph, what compass heading should be maintained? What is the actual speed of the aircraft? 3. A river has a constant current of 3 kph. At what angle to a boat dock should a motorboat, capable of maintaining a constant speed of 20 kph, be headed in order to reach a point directly opposite the dock? If the river is ½ a kilometer wide, how long will it take to cross? Because these problems are difficult, students would be instructed to work together to complete them. This would alleviate some frustrations and “stuck” feelings by allowing them to ask for help. Ultimately, talking through what they are doing and successfully completing challenging problems will take students to a deeper level of involvement with their own learning. I believe vectors are fairly easy to teach because there are so many real life applications of vectors. However, it can be difficult to get students initially engaged. For this activity, I would have students work in groups to complete a project inspired by Khan Academy’s videos on vector word problems. Students would split off into groups and watch each of the three videos on Khan Academy that have to do with applications of vectors in two dimensions. Using these videos as an example, students will be instructed to come up with a short presentation or video that teaches other students about vectors in two dimensions using real world applications and examples. Immediately when I see vectors, I think of one specific movie quote from my late childhood that I’ll always remember. The villain named Vector from Despicable Me who “commits crimes with both direction AND magnitude” is a fellow math nerd and is therefore one of my favorite Disney villains of all time. So of course, I had to find the clip (linked below) because I think it is absolutely perfect for engaging students in a lesson about vectors as soon as they walk in the door, and it is memorable and educational. I would refer back to this video several times throughout the lesson and in future lessons because it is a catchy way to remember the two components to vectors. This would also be great to kick off a unit on scalars and vectors, because it would get kids laughing and therefore engaged, plus they will always remember the difference between a scalar and a vector (direction AND magnitude!). This student submission comes from my former student Trent Pope. His topic, from Precalculus: computing a dot product. This website gives an example of a word problem that students could solve, and it has real-world applications. It is not a complete worksheet for students to work on. The teacher would have to create more word problems incorporating the idea of this website. The example on this web page is that you are a local store owner and are selling beef, chicken, and vegetable pies 3 days a week. The owner has a list of how many pies he sells a day and how much they cost. The cost of beef pies are $3, chicken pies are $4, and vegetable pies are $2. On Monday he sells 13 beef, 8 chicken, and 6 vegetable pies. Tuesday he sells 9 beef, 7 chicken, and 4 vegetable pies. Finally, on Thursday the owner sold 15 beef, 6 chicken, and 3 vegetable pies. Now, let’s think about how we can solve for the total number of sales for Monday. First, we would solve for the sales of the beef pies by multiplying the price of the pie and the number we sold. Then we would do the same for chicken and vegetable pies. After finding the sales of the three pies, we would add up sales to get the total amount for the day. In this case, we would get $83 of sales on Monday. The students would do the same thing for the other days the store is open. This is an example of the dot product of matrices in a word problem. An idea I was able to see in an actual classroom during observation this week was the use of Fantasy Football in matrices. A teacher at Lake Dallas High School has her classes in a Football Fantasy League competing against each other. The way they started this activity is that the students have to keep up with the points that their teams are earning. They are doing this by the information the teacher gives them about how to score their players. Each class chooses one quarterback, running back, wide receiver, kicker, and defense to represent their team. The point system is the same as in the online fantasy. For instance, Aaron Rodgers, quarterback for the Green Bay Packers, throws for 300 yards, two touchdowns, and one interception. The points Rodgers earns you for the week comes from taking the several yards and multiplying by the points earned for each yard. Then, do the same for touchdowns and interceptions. After computing this, you will then add the numbers up to get the total points you receive from Aaron for the week. This is using dot product because we have two matrices, which are the stats that the player receives in the game, and the points you get for those same stats. By doing this activity, the students would be working on this aspect of pre-calculus for the entire football season. is defined. 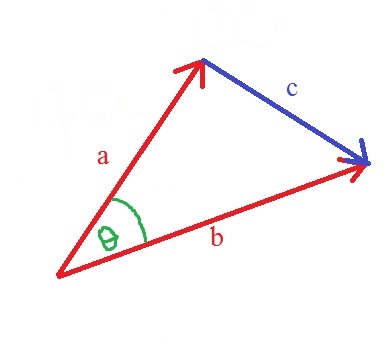 This is the measure of the angle between the two vectors and . The Cauchy-Schwartz inequality assures that the quantity under the square root is nonnegative, so that the standard deviation is actually defined. Also, the Cauchy-Schwartz inequality can be used to show that implies that is a constant almost surely. Furthermore, if , then for some constants and , where . On the other hand, if , if , then for some constants and , where . Since I’m a mathematician, I guess my favorite application of the Cauchy-Schwartz inequality appears in my first professional article, where the inequality was used to confirm some new bounds that I derived with my graduate adviser. This student submission comes from my former student Zacquiri Rutledge. His topic, from Precalculus: using vectors in two dimensions. Add vector A and vector B, what do you get? How about when we take the dot product of A and B? What is the magnitude of A, B, and A+B? All of these are basic questions that a teacher might ask their students during a basic high school pre-calculus class. However, how does the teacher respond when a student asks “Where am I ever going to see this again”? In mathematics, a student might never see vectors again unless they take higher math such as Calculus I through III, or possibly Linear Algebra. During the first two courses of Calculus students will continue to expand on the ideas of two dimensional vectors by talking about the path an object might take through the air after leaving a cannon or being thrown off a cliff. Calculus III (or vector calculus) however is a much stronger example of how vectors will be used in further education of mathematics. During this class students will not only look at two dimensional vectors and review simpler ideas, but they will expand these ideas into the three dimensional world creating three dimensional vectors. Here students will discuss what kind of shape or planes a combination of three vectors might create. A scientific use for two dimensional vectors is in physics. During a physics class, students talk about forces that act on objects as they move or when an object hits another. To do this, students draw vectors to represent the magnitude of the force that is acting on the object and the direction the force pushes or pulls the object. For example, in the previous paragraph it was mentioned about an object being shot from a cannon and the students measuring the path the object might take. In physics, the students might do the exact same thing, but by looking more in depth at the forces acting on the object. Forces might include the force of the cannon firing the object at a certain angle into the air, gravity pulling that object toward the ground, and even the friction of the air on the object as it soars through the air. Each one of these forces is acting on the object as it moves, either helping the object move farther and faster or attempting to slow it down. However, two dimensional physics is not the end of vectors; just like calculus, physics goes on to discuss what happens to objects in a three dimensional world and the forces that act on them. So a very easy answer to give the student asking where he/she will see vectors again is in every day real life. You have explained to your students that vectors are in everyday life and they still do not believe you. You have shown them countless examples on the board, drawing pictures of airplanes and the paths they fly through the air, objects being dropped from a cliff, objects being shot from a cannon, et cetera, and they still do not believe that vectors have any importance or use! Then you simply ask, has anyone ever seen a show called MythBusters on the Discovery Channel? Now MythBusters is a very well-known show, not only because it has been around for twelve years, but also for some of the crazy things that they test in the name of science. For example, some of my personal favorites include them making a boat out of pykrete, the many episodes on the uses of duct tape, and testing if a bullet dropped at the same time as a bullet shot from a gun will hit the ground at the same time. The great thing about this show is it is full of great examples of how physics affects things in real life. Also, not only do they test the myths, they explain how they are testing them, why they are testing them the way they are, and why it makes sense scientifically or does not. For example, during the bullet episode, they explain that once the bullet is shot from the gun, the only forces acting on the bullet are gravity and air friction. The only forces that would be acting on the bullet dropped would gravity and air friction as well. So in theory these two bullets should hit the ground at the exact same time if they are projected from the same height. By the end of the episode they had proven this by figuring out the best way to set up a live test and using a high speed camera to measure the time it took for each to hit the ground. For a high school class, this would be very easy to draw on a chalk board and walk the students through the thought process of why this happens using vectors to draw out the forces. Finally, the Internet gives us access to a lot of videos. This would allow a teacher who is talking about Mythbusters and their amazing examples of vectors in motion the chance to display quick clips of some of their tests. Of course the teacher will need to have researched a few before class in order to make sure they can be used as vector examples, but after a video has been played the teacher could ask the students to explain why the test was either plausible or false. On a small scale this video, https://www.youtube.com/watch?v=BLuI118nhzc , works great to show how a truck moving at the same speed as a soccer ball being shot from the back cancels the two forces, leaving gravity as the only force acting on the ball. Using vectors, a teacher could explain how one vector is positive and the other is negative of the same magnitude, cancelling the other out. Then show how only one vector on the ball remains, pulling the ball in that direction. A generation ago, this formula used to be taught in a typical Precalculus class (or, as it was called back then, analytical geometry). However, I find that analytic geometry has fallen out of favor in modern Precalculus courses. Why does this formula work? 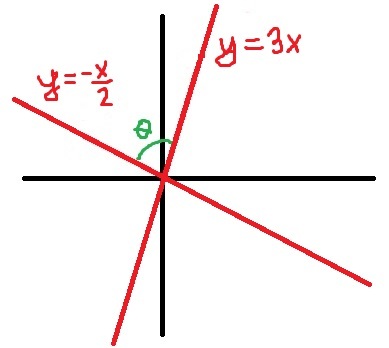 Consider the graphs of and , and let’s measure the angle that the line makes with the positive axis. The lines and are parallel, and the axis is a transversal intersecting these two parallel lines. 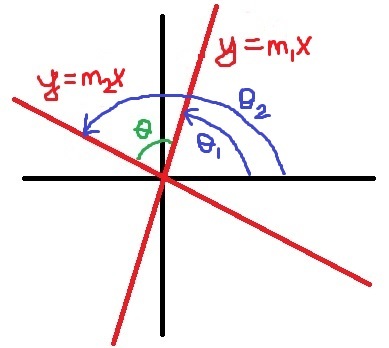 Therefore, the angles that both lines make with the positive axis are congruent. In other words, the is entirely superfluous to finding the angle . The important thing that matters is the slope of the line, not where the line intersects the axis. We now turn to the problem of finding the angle between two lines. As noted above, the intercepts do not matter, and so we only need to find the smallest angle between the lines and . The above formula only applies to non-perpendicular lines. However, the perpendicular case may be remembered as almost a special case of the above formula. After all, is undefined at , and the right hand side is also undefined if . 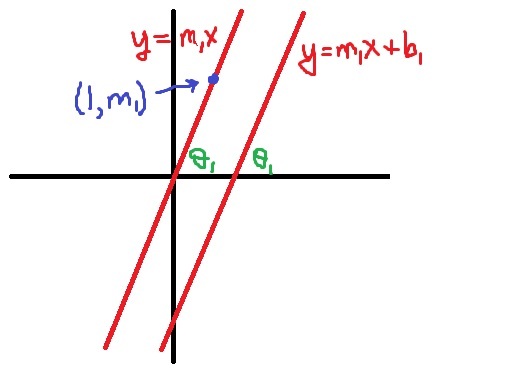 This matches the theorem that the two lines are perpendicular if and only if , or that the slopes of the two lines are negative reciprocals. Here’s a straightforward application of arctangent that, a generation ago, used to be taught in a typical Precalculus class (or, as it was called back then, analytical geometry). Find the smallest angle between the lines and . This problem is almost equivalent to finding the angle between the vectors and . I use the caveat almost because the angle between two vectors could be between and , while the smallest angle between two lines must lie between and . Not surprisingly, we obtain the same answer that we obtained a couple of posts ago using arccosine. The following picture makes clear why . In tomorrow’s post, I’ll explain why the above formula actually works. 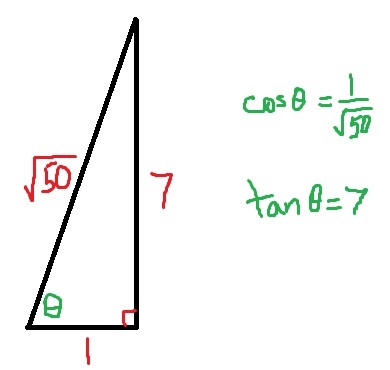 The Law of Cosines can be applied to find the angle between two vectors and . To begin, we draw the vectors and , as well as the vector (to be determined momentarily) that connects the tips of the vectors and . We now apply the rule , convert the square of the norms into dot products. We then use the distributive and commutative properties of dot products to simplify. The good news is that there’s nothing special about two dimensions in the above proof, and so this formula may used for vectors in for any dimension . In the next post, we’ll consider how this same problem can be solved — but only in two dimensions — using arctangent. Here’s a straightforward application of arccosine, that, as far as I can tell, isn’t taught too often in Precalculus and is not part of the Common Core standards for vectors and matrices. Find the angle between the vectors and . This problem is equivalent to finding the angle between the lines and . The angle is not drawn in standard position, which makes measurement of the angle initial daunting. We recall that is the dot product (or inner product) of the two vectors and , while is the norm (or length) of the vector . In the next post, we’ll discuss why this actually works. And then we’ll consider how the same problem can be solved more directly using arctangent. This student submission comes from my former student Candace Clary. Her topic, from Precalculus: computing a dot product. The dot product in algebra is defined as the magnitude and direction of two different vectors, multiplied together. After algebra, the students will start working with vectors. In calculus they will start seeing vectors and finding cross products and dot products of those vectors. Once they get to a linear algebra class, they will begin to work with matrices. Matrices can be seen as vectors, and the dot product of these can then be computed. The dot product can also be used in geometry. The dot product is in geometry can be used to find the angle between two vector, and it can be used to find the length of a vector, with the angle in between known. Computing the dot product of vectors requires the students to remember things like order of operations, and how to multiply several numbers. Knowing how to compute a dot product can help students in physics classes, chemistry classes, and other types of science classes. One activity that I could do as a teacher is by using big sheets of graphing paper. I can ask the students to work in pairs, and have them draw vectors on a piece of poster board graph paper. They would need to draw three or more vectors, and label them to let other students know what their vectors are. After they have drawn three or more, they will pass it to another group. These groups will then determine the dot product of the vectors that were drawn. They will be required to show their work on the side, neatly, and be able to explain how they got their answers. After the work has been completed, they will need to graph the dot products of the vectors in a different color. Once all the groups are done, the posters will be hung around the room and the class will take a gallery walk to looks at the posters and take notes on the solutions so they are able to see it many times. These posters will then stay up in the classroom for most of the unit for reference. 1. How can technology (YouTube, Khan Academy [khanacademy.org], Vi Hart, Geometers Sketchpad, graphing calculators, etc.) be used to effectively engage students with this topic? Note: It’s not enough to say “such-and-such is a great website”; you need to explain in some detail why it’s a great website. This video on YouTube will be great to engage the kids. This teacher intrigues me, he is so hyper when it comes to math and really explains it in a simple way to understand. In this video, he breaks the topic down and shows many different ways to compute the dot product of a vector. I like the fact that he states the properties of the vectors before he starts to talk about computing them. I also like that he keeps them up on the board and on the screen while he uses a numerical example. He also shows how we can use the dot product to find the angle between two vectors. He does this in the second part of the video, which means I can cut the video where I need, depending on what topic I am teaching. I think that this teacher does a great job of explaining, and even though this is an educational video, where material is taught, I think kids will learn from it. This student submission comes from my former student Derek Skipworth. His topic, from Precalculus: vectors in two dimensions. A. How could you as a teacher create an activity or project that involves your topic? While it may be a cop-out to use this example since I am developing it for an actual lesson plan, I will go ahead and use it because I feel it is a strong activity. I am developing a series of 21 problems that will be the base for forming the students’ treasure maps. There will be three jobs: Cartographer, the map maker; Lie Detector, who checks for orthogonality; and Calculator, who will solve the vector problems. The 21 problems will be broken down into 7 per page, and the students will switch jobs after each page. The rule is that any vectors that are orthogonal with each other cannot be included in your map. There are three of these on each page, so each group should end up with a total of 12 vectors on their map. Once orthogonality is checked by the Lie Detector, the Calculator will do the expressed operations on the vector pairs to come up with the vector to be drawn. The map maker will then draw the vector, as well as the object the vector leads to. Each group will have their directions in different orders so that every group has their own unique map. The idea is for the students to realize (if they checked orthogonality correctly) that, even though every map is different, the sum of all vectors still leads you to the same place, regardless of order. B. How does this topic extend what your students should have learned in previous courses? Vectors build upon many topics from previous courses. For one, it teaches the student to use the Cartesian plane in a new way than they have done previously. Vectors can be expressed in terms of force in the and directions, which result in a representation very similar to an ordered pair. It gets expanded to teach the students that unlike an ordered pair, which represents a distinct point in space, a vector pair represents a specific force that can originate from any point on the Cartesian Plane. Vectors also build on previous knowledge of triangles. When written as , we can find the magnitude of the vector by using the Pythagorean Theorem. It gives them a working example of when this theorem can be applied on objects other than triangles. It also reinforces the students trigonometry skills since the direction of a vector can also be expressed using magnitude and angles. E. How can technology be used to effectively engage students with this topic? The PhET website has one of the best tools I’ve seen for basic knowledge of two dimensional vector addition, located at http://phet.colorado.edu/en/simulation/vector-addition. 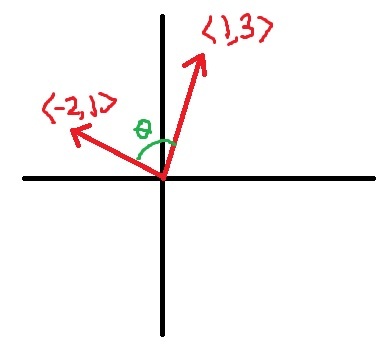 This is a java-based program that lets you add multiple vectors (shown in red) in any direction or magnitude you want to get the sum of the vectors (shown in green). Also shown at the top of the program is the magnitude and angle of the vector, as well as its corresponding and values. What’s great about this program is it puts the power in the student’s hands. They are not forced to draw multiple sets of vectors themselves. Instead, they can quickly throw them in the program and manipulate them without any hassle. This effectively allows the teacher to cover the topic quicker and more effectively due to the decreased amount of time needed to combine all vectors on a graph.